Chocolate fans, this one is for you. 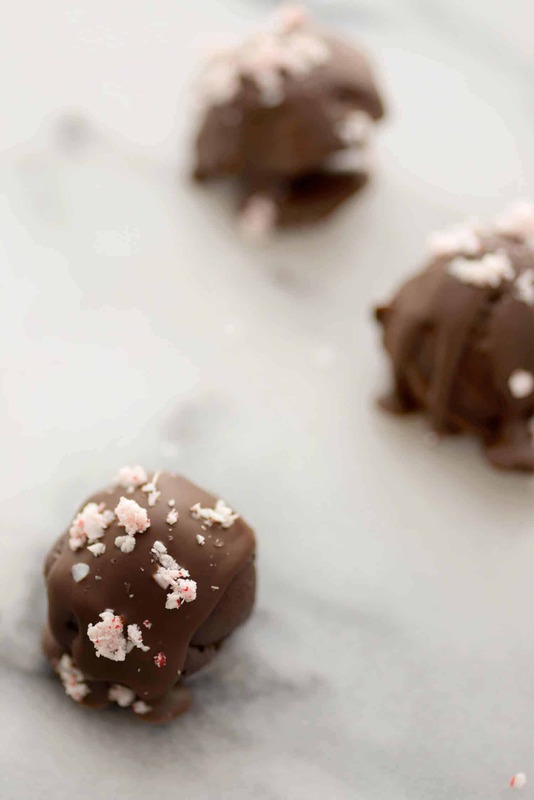 Dark chocolate truffles covered in more dark chocolate and sprinkled with crushed candy canes. If Christmas had a taste, these might be it. I’m so glad that chocolate is back in my good graces. I could barely touch the stuff while pregnant and now I’m making up for lost time. I had a major craving for dark chocolate a few weeks ago and ta-da, these truffles were born. 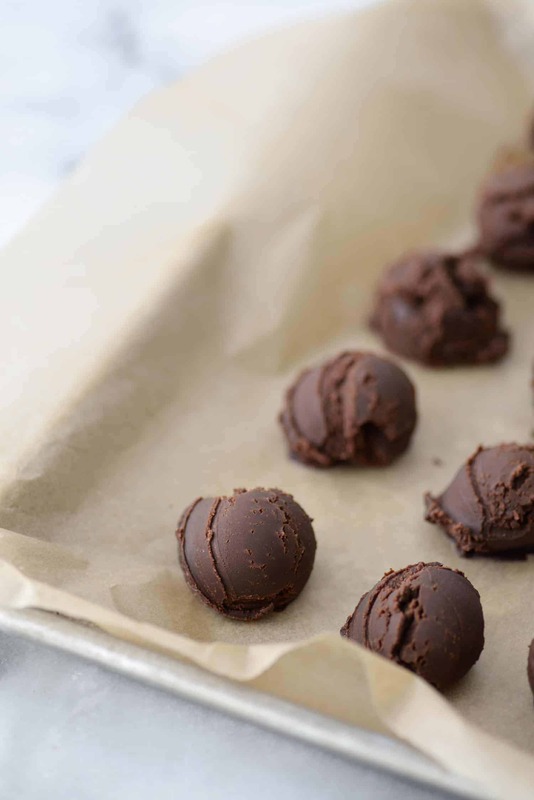 I’ve made the base of these truffles several times and they are practically fool-proof. Get the good chocolate for these- they are worth it. I usually buy a mixture of dark and milk chocolate bars from Trader Joe’s but feel free to sub in your favorite. And, of course, a dairy-free chocolate to keep these vegan if you wish. Finely chop the chocolate, then pour warm coconut milk and maple syrup over. Cover with a towel to allow the heat to stay in and melt the chocolate, then whisk together. You’ll be rewarded with a thick chocolate mixture. Place that in the fridge to harden, then form into truffles. I use this tablespoon scoop to make the truffles, but hands also works (it’ll just be messier). 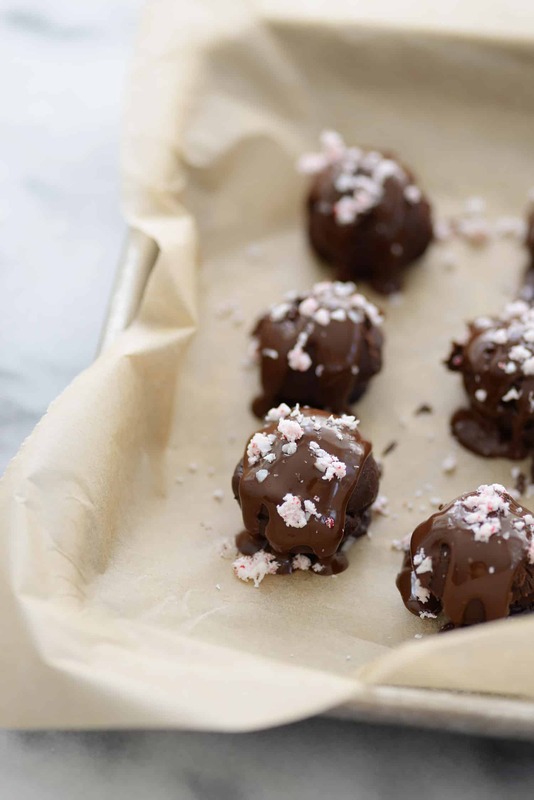 To finish, drizzle on more dark chocolate and sprinkle on crushed candy canes. Keep these stored in the fridge or freezer for a yummy, pre-made dessert. 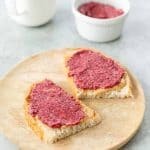 I’ve been loving these with a cup of peppermint tea in the evening! 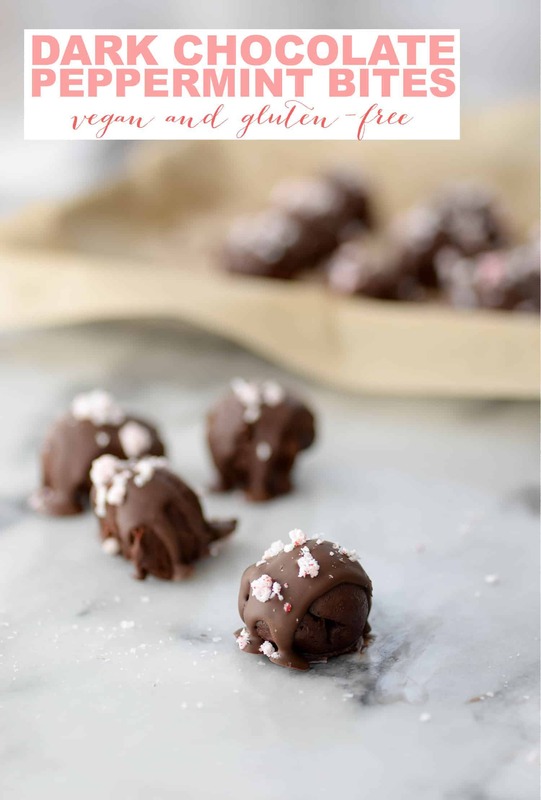 Dark Chocolate Peppermint Truffles! These truffles are ultra-rich, perfect for holiday gifts! 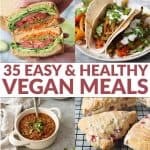 Vegan and gluten-free, super easy to make! Very finely chop the chocolate and place in a medium size bowl. In a separate, smaller bowl, whisk together the coconut milk and maple syrup. Place in the microwave and cook until very warm but not boiling, about 30 seconds. (Alternatively, heat a small saucepan in a double boiler over medium heat until just simmering). Add the coconut milk mixture to the chocolate and loosely cover with a towel to keep the heat in. Don’t touch for 5 minutes. 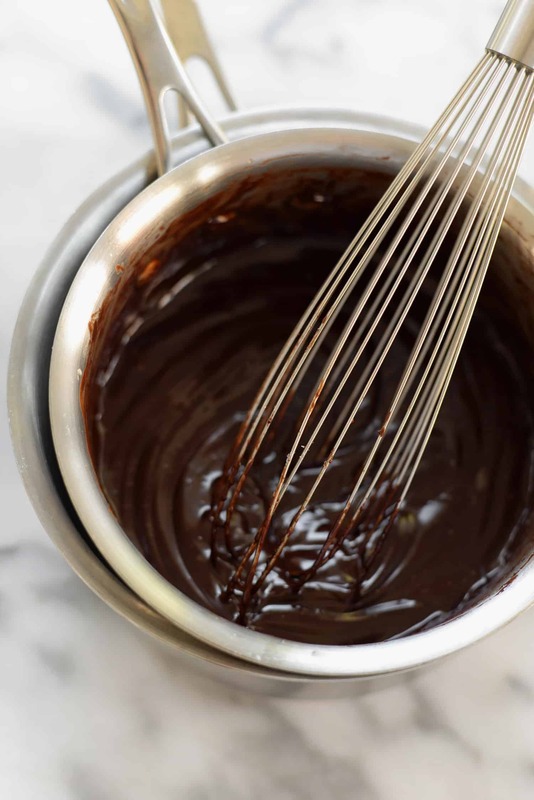 Remove the cover and use a spatula to gently stir the chocolate together, until it melts completely. Add in the vanilla and mint extract and place the creamy, smooth chocolate mixture in the fridge until hardened, about 2-3 hours. Place truffles back on parchment paper and place back in fridge to harden, about 30 minutes. Melt the chocolate; place the chocolate chips and coconut oil in a bowl and microwave in 15 second intervals, stirring between each, until melted. 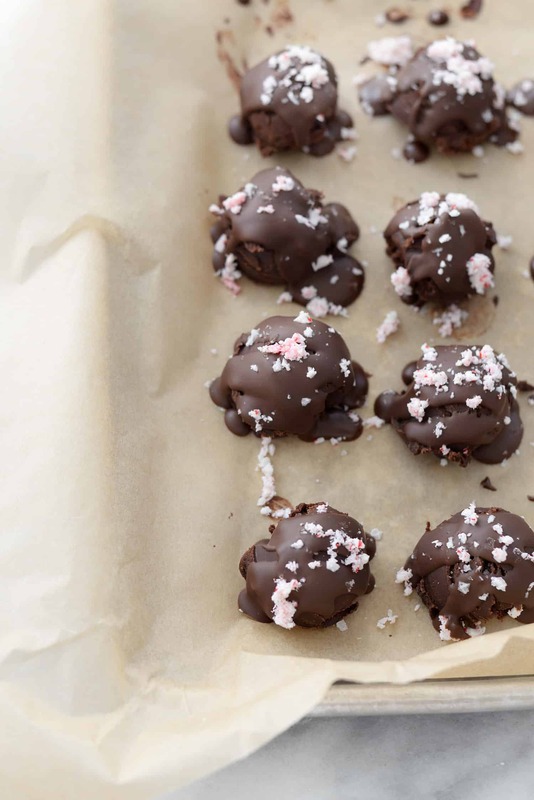 Drizzle the dark chocolate on the truffles and sprinkle on crushed candy canes. Refrigerate until hardened and serve! Store in the fridge for up to a week, individually frozen for up to 3 months. These beauties have my name written all over them. Mint chocolate-anything is automatically amazing, but these truffles look particularly luscious.